As some of you may have heard, i returned to OSRS a few days ago. I am currently rebuilding and like to share this journey with you all. 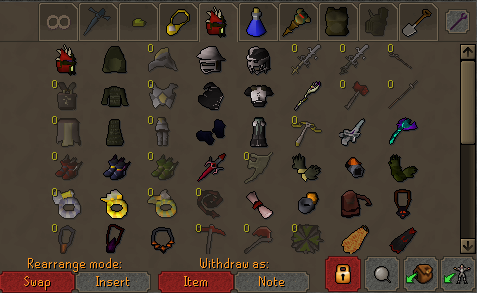 I still have all placeholders from the items i had before i quit, so i can show my progress with pictures of the bank (with the end goal being all placeholders filled again). I will upload an update every monday at the beginning of the day, to show my progress of the week. Quite a road ahead of you. Good luck buddy! somebody give this man a dragon axe!